The Lego Den – Page 16 – Lego news, MOCs and reviews. All the LEGO world in one place! One of the movies that marked a generation was Toy Story, the first movie computer animated movie produced by the giant Pixar. Not only its quality was recognised globally, but LEGO had the excelent idea to transport the theme to their world. They created about 15 sets that cover themes from all the 3 movies. As i mentioned in a previous post, i bought a pack of 13 minifigures. 2 were from Sponge Bob an the other 11 were from Toy Story. The figures i bought makes part of one of the first five sets. A little side note: i think this figure is light year ahead from the figure that is rumoured to appear in a not so certain LEGO Minifigure Disney exclusive. Like the previous figure, its dificult to know to which set this figure belongs, but its guaranteed that belongs to the first 4 sets. These 4 green soldiers are well known in the Toy Story Universe. The figures are not complet and are missing some key elements like guns and binoculars. The doctor of the group also didn’t came with the purshase. These figures are available in the set 7595: Army Men on Patrol. Hamm: one of the supporting characters of Woody and Buzz, This figure is particularly well conceived because, like the movie original, it a place to insert the coins and a place to remove like a real money box. Its available in the sets 7598: Pizza Planet Truck Rescue and 7596: Trash Compactor Escape. Rex: One of the many toys that appear in the Toy Story franchise. Although it has a small part in the first movie, it possess more screen time in the second and third movies. Rex is available on the sets 7597: Western Train Chase and 7598: Pizza Planet Truck Rescue. Lots-o’-Huggin’ Bear: Also known as Lotso, its the main antagonist of the Toy Story 3 movie. As a figure, is well conceived it the staff and all. Its available in the sets 7599: Garbage Truck Getaway, 7596: Trash Compactor Escape and 7789: Lotso’s Dump Truck. In the end, each minifigure cost me about $3 which I consider a very good price for a minifigure. I have the luck of having a friend that has a friend that as a cousin that can arranje a closed box of LEGO minifigures at a fair price. I bought my first case with the 14th series and i repeated that with the series 15. This time i decided to make a small video with the opening and selection of the minifigures. To have an idea, each box has 60 minifigures. 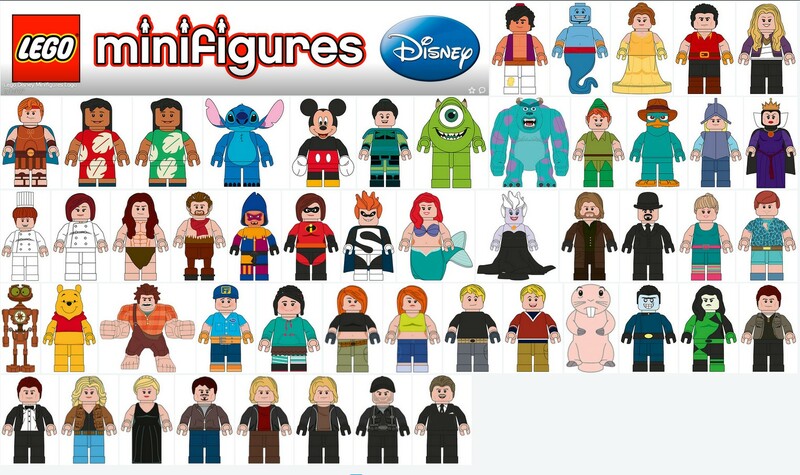 From those 60, we can get 3 complete collections of minifigures. From the remaining 12, there is usually 3 figures that repeate themselves 5 time in a box. Everything is in the below video including statistics of the minifigures in the box. Hope you like it. Today some new figures arrived to the Den, some of which i’ll speak in the next couple of days. They are 13 at total! A “small” buy i made to a person i regularly by minifigures. Two of the figures that came in the group i bought were from the series Sponge Bob Square Pants, an american cartoon series owned by Nickelodeon. I don’t know why this series has so much success, but the fact is that, according to wikipedia, Nickelodeon has generated more than 8 bilion dollars in revenue only in merchandising. Maybe because of its success, LEGO decided to launch a collection of 14 sets between the years of 2007 and 2011. From the left we have the main character, Sponge Bob and at its right we have his friend Patrick Star. Both figures came with the set 3816: Glove World from 2011. I confess that I’m not a fan of the cartoon, but because they came in a package deal I will not say that I don’t want them. I estimate that the cost of the minifigures was about $3 each. A awesome price for some figures which the set was removed from circulation in 2011. Is this the special series of minifigures of 2016? 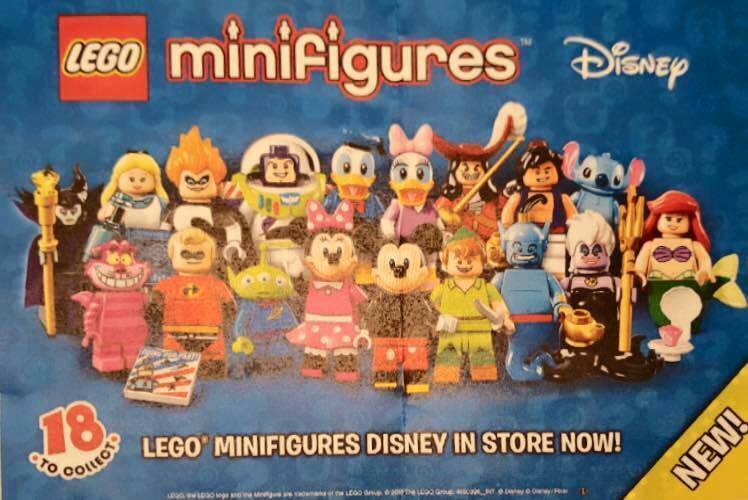 This image confirms some rumours from the last couple of months: there will be an exclusive collection of LEGO disneys minifigures!!! This is huge because not only it appeals to a market of fans of the disney world (my wife is going to love this), but it also appeals to young ones and adults that love LEGO and reinforces the connection between LEGO and disney. There is a total of 18 figures (2 more than the usual collection) and there is not a expected release date, but i have a feeling that this collection will be release in the beginning of May. Posted on March 8, 2016 March 7, 2016 Categories Lego Minifigures2 Comments on Is this the special series of minifigures of 2016? Is this the look of the new Series 16? Rumors appear about the new cover of the series 16. If it’s true, it means that we will have a new tematic series by the spring (the we had The Simpsons) before series 16. According to the website, this new series will be launched by fall, it will have the yellow color and its number will be 71013. Posted on March 7, 2016 March 7, 2016 Categories Lego MinifiguresLeave a comment on Is this the look of the new Series 16? Welcome to The Lego Den. Expect a lot of lego news and my personal experience with Lego, the increase of my collection and my new Lego sets. Hope you come regularly. I expect a lot of feedback!